Jitterbug Bakery: Eat. Drink. Blog. Healthy cafe & community space with wifi & a staff of WordPress experts to help with your blog and creative pursuits. Also, classes! 204 backers pledged $17,185 to help bring this project to life. Tybee Island, GA is a small community outside of Savannah with a heavy tourist trade. We have amazing restaurants, but most focus on seafood. There's no place to go for a coffee and pastry in the morning (unless you're willing to drive 7 miles to the next island), no good vegetarian options or wifi cafe to serve as a casual meeting place for friends and strangers (unless you're willing to drive 17 miles to Savannah), and no place to go (other than my living room) for help setting up a WordPress site. The Jitterbug Bakery will change all that, and more! Bakery. Everyone in this town wants a bakery. There hasn't been one for years, and people are getting desperate. Muffins and scones in the morning, and treats throughout the day. Think key lime cupcakes, raspberry brownies, bite-size cookies, and rotating baked goods. Coffee. Many locals and most tourists wish we had decent coffee and tea, or lattes of any kind. The two breakfast places have nondescript drip coffee and Lipton tea bags. We will offer a custom blend of organic coffee from Perc Coffee Roasters in Savannah, espresso drinks, and a variety of awesome teas. Food. Fried seafood is great, but it gets old. We'll have rotating vegetarian specials (think Moosewood) that feature fresh ingredients from local suppliers -- we're lucky to have a number of produce growers and dairy farms nearby. We'll have localish beer, some decent wine, and occasionally stronger drinks like sangria or special rum cocktails* to wash it down. Also, Jitterpacks! Jitterpacks will be yummy pack lunches + a coffee drink to power the road trip when you leave town. We're also looking into kosher certification. Genius Waitresses. Okay, not geniuses and not waitresses, but everyone we hire will be proficient with WordPress, so people will be able to ask for help with their website from anyone who's working, including setting up a blog for the first time to post vacation pictures. Community Hub. The Jitterbug website will have a section that features blog posts that customers published while at the Jitterbug. Meetups. There's no place on Tybee that's good for group meetings -- places are either too loud or don't have wifi. We'll host the local WordPress meetup group, a book club, a knitting circle, and other groups in search of a haven for their meetings. Who knows, maybe even the city council will start having meetings here! Classes. In the summer tourist season, there is nothing to do at night on Tybee except go to a bar or drive into Savannah. We'll have free lectures and paid classes in web/WordPress stuff (get that blog going! ), digital photography (take better vacation pictures! ), cooking (eat like this at home! ),and other related interests. In the off-season/school year, we'll do free classes for school kids (the high school computer class is still teaching PowerPoint and Access instead of WordPress and Google Apps) and senior citizens (an increasingly large segment of the online population). Some of the lectures/classes will be streamed and/or recorded and posted to the Jitterbug website and WordPress.tv. I wrote a business plan, found someone to buy the building and lease it to me, took 10K out of my savings to get started, and began the work of making the vision a reality. But vision is expensive! We'll need to do some construction/plumbing to accommodate the espresso equipment (and buy the equipment, which is spendy, even refurbished), redecorate with better seating inside, and purchase initial inventory before we start generating income. If we raise $15,000, that would cover most of the new equipment and the related construction. If we get a huge swell of support and can manage to raise $250,000, then in addition to starting the cafe, we could buy the building ourselves and not have to worry about conflicts with the landlord (for example, making improvements to better accommodate the classes). In that case, we'd also have enough padding that we could start offering free classes for kids this year before school lets out instead of waiting until fall. It's on the road into town, so everyone will see it driving into Tybee. It's next door to the post office -- we don't have home mail delivery here, so all the locals will pass by often. It's across the street from the Visitor's Center, where the staff are impatient for us to open so they can come over for coffee and send the visitors. Last year more than 30,000 visitors stopped at the center. My mother, a retired restaurant manager who recently moved down here (and started a blog! ), will do the books and help run the place. Everyone on the island is already excited for it to exist. Vacation rental managers have offered to promote us to their guests. 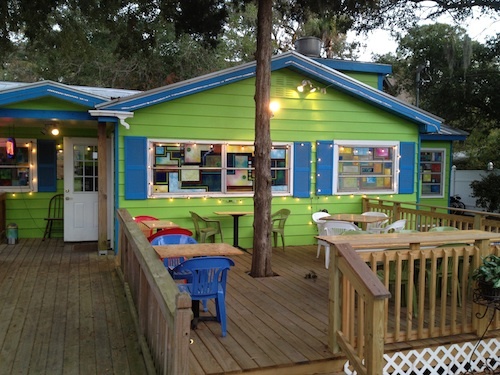 We will fill a big hole in the food/drink offerings on Tybee where there is little to no competition but a big need. Having a place to go for help with WordPress is unique and people are already asking when we'll start classes. We'll be making our debut one way or another with a booth at the Tybee Island Wine Festival on April 14. This Kickstarter campaign will run for 3 weeks, so that all the fundraising wil be done by time we move in to the building. We plan to soft-launch on April 15 with a Grand Opening on May 1. In addition to posting updates for backers here, there's more information and a blog with all the startup progress at buyjaneabakery.com. I've outlined a bunch of rewards at different contribution amounts in the column to the right, from care packages to websites. If you can help make this vision a reality, we'll love you forever -- and the care package treats ill be delicious! *People who've hung out with me at Automattic parties and/or WordCamps will recognize Mop-bucket Sangria and Malibu Staceys. Public thanks on Twitter, and a warm feeling inside. Thanks on Twitter, a smile just for you (and photographic evidence), and a tasty bakery recipe emailed to you. The above, plus a Jitterbug sticker perfect for your laptop. If you're local, stop by for a cookie. The above, plus a Jitterbug travel mug, and a blog post saying how awesome you are. If you're local, you can pick up the mug, filled with coffee. The above, plus an invitation to our grand opening this spring, and a copy of the Jitterbug cookbook when it’s ready (June or July). The above, plus a limited edition backer’s tshirt (have you seen how awesome my WordCamp tees are?). An hour of WordPress plugin code/security review by Andrew Nacin, WordPress core developer. Plugin must be free, 100% GPL, and in the WordPress.org directory to be eligible. An hour of one-on-one time from Lisa Sabin-Wilson, author of WordPress for Dummies. WP training, site reviews, install/upgrades or just an hour of ‘pick my brain on WP’ type stuffs. An hour of one-on-one time from Pete Mall, WordPress core contributor and multisite expert. Available for code review, security, etc. The above, plus a 12oz bag of our custom coffee blend, Jitterbug Perfume. Also, get a recipe once a month, and your care package bumps up in size (or if you're local, you can choose a meal for up to 4 at the bakery instead of a care package). The above, plus if you chose a bakery care package you’ll get one per month instead of just one, or if you chose a meal for up to 4 at the bakery, you’ll get 2 meals for up to 4. The above, plus you can have a 2-hour private party/WordPress lesson at the bakery and we’ll provide all the food for up to 25 people, OR a 2-hour WordPress class via skype, OR one of our classes will set up a WordPress blog for you. The above, plus we’ll name a muffin after you OR one of classes will also customize a theme just for your site based on your personality/your brand.